When the two best three-point shooting teams in the conference get together you naturally expect a high scoring, perimeter shooting exhibition. That’s…kind of what you got as the Louisville women took on Virginia Tech in Blacksburg Sunday afternoon. Virginia Tech is a team that’s far better than their record would indicate, and they gave the Cardinals all they could handle. But fortunately the Cards would escape the Hokies with a 76-63 victory to improve to 23-1 and 10-1 in ACC play. It’s difficult to doubt Jeff Walz and staff’s scouting ability by any standard at this point. Walz repeatedly mentioned that the three game stretch from Syracuse to Virginia Tech to Miami had been circled on his schedule since the beginning of the season. No casual spectator would be faulted for overlooking a struggling Hokies squad that had dropped seven of their first nine games in ACC play, but the Cardinals and their informed fan base knew better. 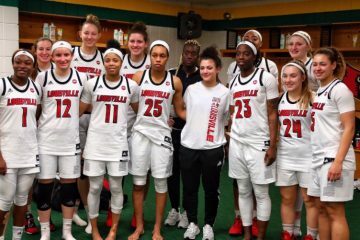 An Atalantean effort was necessary to escape with victory, and fortunately Sam Fuehring and Asia Durr were fit to deliver. As for the Hokies, it was the same old story. Obvious talent, maximum effort, but just not enough to get past the post in front. Freshman standout Dara Mabrey (of the Mabrey clan, most notably at Notre Dame) would do everything she could to keep the Hokies in the hunt, contributing 17 points with 3 for 6 from three-point range. Joining her was the ACC’s leading rebounder Regan Magarity with 14 points, but an eight rebound total that was four shy of her average. Critically, the Cardinal defense would stymie Tech’s leading scorer Taylor Emery who managed less than half of her season average with eight points. Thanks primarily to Sam Fuehring’s 13 rebounds, the Cardinals would just barely lose the battle on the glass 36-33 to the Hokies. 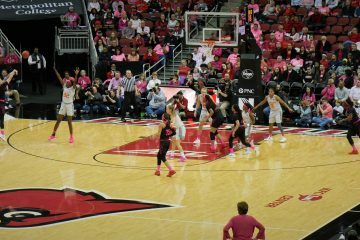 Blocks and steals were nearly even for both teams, but the Cards would eek out a victory in the paint with 30 points to the Hokies’ 24. Statistically, the final tally was a fairly even split. And so it was the Cardinals offense that would have to power them past a Virginia Tech team who cut a 20 point lead to three with less than a minute to play. At the end, all judges’ cards would give the fight inside between Tech’s Magarity and Louisville’s Fuehring to the Cardinals senior. 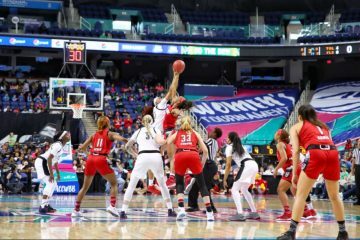 Six of Sam’s eight field goals came within four feet of the basket as she also went five for five from the free throw line to notch a 21 point, 13 rebound double-double. Compare this to Magarity’s 14 points and eight rebounds. And when it was needed, Fuehring’s strength proved invaluable as she ripped down a critical late game rebound while being held in a Hokie choke hold. While Fuehring was certainly in good form, all burdens and accolades cannot be thrust upon her. 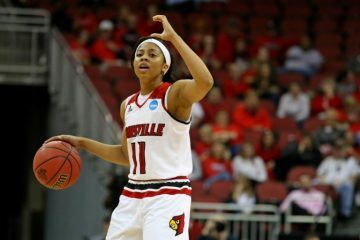 In a game where the Cardinals lost or scraped by in the first, third, and fourth quarters it would be the #NiteNite performance from Asia Durr in the second that sparked the Cardinals fire. Durr was five for five from three-point range midway through Q2, finishing the game five for seven from outside with 34 points, 6 rebounds, 2 assists, and 2 blocks. That season high points total was certainly necessary in a game where only Fuehring joined Durr with double-digit points, with all other Cardinals contributing less than a quarter of the final tally. It also placed Asia firmly in second place for the all-time Louisville scoring record. As that 15 point halftime Cardinals lead dwindled in a third quarter featuring only 11 Louisville points on 26.7% shooting, one was left to wonder if the Cards were on another one of Sam Purcell’s smoke breaks. Virginia Tech had just come off of a stunning fourth quarter comeback at Boston College to notch their second ACC win, and no doubt the assembled Hokies fans smelled another opportunity for late-game fireworks. The fourth quarter began punch for punch as the teams traded baskets, and for a time it seemed as if the cushion built in the second quarter would hold. A series of quick Louisville turnovers and a streak of Hokies rebounds, however, would draw Tech within three as the clock ticked over to 0:34 remaining. The Cardinals certainly looked a bit jittery, and Jeff Walz did all he could to calm them down and get them to execute. In a comical moment, Jeff Walz shouted cross-court to Arica Carter, “A.C.! The clock is our friend!” That advice wasn’t immediately taken, but fortunately the Hokies were forced to begin fouling as time wound down. The Cardinals went 13-14 from the charity stripe on the night in what would prove to be the nail in the coffin. Combine that with Fuehring’s crucial late-game rebounding effort, and it sealed a hard fought and tough won ninth-straight victory. The Cardinals have often shown a tendency to take at least one quarter off against lesser opponents. The only loss of the season came against Notre Dame and featured a cold third quarter. That performance was, fortunately, not repeated against UConn. Against a dangerous team like Virginia Tech that tendency had a high probability of grabbing defeat from the jaws of victory. There will certainly be times in March where Louisville may not be able to rely on lights out performances from Durr or Fuehring. It’s quite obvious, though, that the Cardinals possess all the necessary tools to prevent such catastrophe. It simply becomes a question of execution and effort. For now, the Cardinals have earned a well-deserved week off. Women’s basketball returns to the KFC Yum! Center next Sunday on #Play4Kay night against a tough Miami team. It remains to be seen whether Louisville’s tendency to take breaks is a physical or psychological symptom. As March approaches, it’s a symptom that may quickly need to find a cure.